My most recent find is this Wade & Butcher "Boone" carbon steel hunting knife. It was discovered together with several other vintage hunting knives in an old leather hunting bag from the 1930's somewhere in Amsterdam. The steel has gotten a dark grey patina from being stored inside the sheath for decennia. On the blade the letters "ILLWELL" are very faintly visible, and through Google i found that originally it spelled "GILLWELL", which is the 144 acre sight North of London given to the Scouts in 1919 and now the worlds historical site for scouts. It seems that the change from "GILLWELL" to "GILWELL" took place when Baden Powell was made the first Baron Baden-Powell of Gilwell in 1929. So in 1919, when the first Wood Badge course was held, it was Gillwell Park. If the info from Google is correct that would date my knife to have been manufactured between 1919 and 1929, although the sheath is probably not original to the knife but most likely from Scandinavian origin. Again a really good and interesting find! Unfortunately I‘m not familiar with those kind of knives or their history. But what I‘m able to judge you are a keen and successfull „Knife-Hunter“ and collector having even old catalogues handy! Keep going on. Currently i'm doing a bit of online research on what kind of steel was used in these knives, and according to this old ad the Boone blades were made from (the famous) Wardlow steel. Question: "What type of knife was used by Camillus in the early years, was it 1095 ? I have a stockman made between 1920 and 1930, use it every day for carving, sharpest pocket knife I every had. I am 64 years old this steel beats them all." 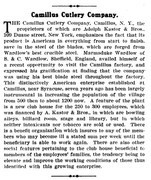 Answer: "Camillus forged their blades from Wardlow's best crucible steel from Sheffield England." Reply: "All I know this blade steel is great, I carve 4 to 6 hours a day, sometime just strop and keep cutting. My new pocket knives will not do this no matter the brand." And from Bladeforums: "The S. & C. Wardlow steel that Camillus imported from Sheffield, England, was derived from about 8o percent pure Swedish iron ore; wide variation in heating did not injure it." "George Goodwin, puddling clay for the making of pots for melting crucible steel, looks like the old Benjamin Huntsman works on Coleridge Rd. I started work there in 1968 as a lad in the forge, George by then was much older and working in the warehouse, he told us lads of these days making pots, and was still a very fit and muscular guy, bulging biceps for a pensioner a fantastic bloke. A piece of Sheffield history here..... Bob." Thanks for the video and the amazing glimpse into the past of crucibles production. Originally the blade used to be full convex ground, but sometime during it's existence a previous owner had sharpened a bit of a rough secundairy bevel into it. The old blunt "edge" measured between 35 and 40 degrees inclusive, while the new edge apex fits almost exactly in the (specifically aimed for) 30 degrees inclusive slot of my Tormek WM200 Angle Master. If need be further thinning can always be done later. There is still a tiny burr on the apex, next step will be to refine the scratch pattern with probably 800 grit wet & dry. After that the plan is to recut the swedge with a small diamond file followed by wet & dry paper & some WD40. The handle has already been smooth sanded with 400 grit wet & dry and treated with several coats of warm Granger's wax. After 72 years as a blade forger in Sheffield, Albert Craven has finally decided to retire. Also this fascinating color documentary made in 1945 about large scale steel manufacture in Sheffield. In the beginning there is even some footage of crucible steel manufacture. The blade has been refined through grit 800 and 1000 wet & dry (again using WD40 on the piece of conveyor belt), removed the very fine burr on the Tormek leather wheel, and the apex can now whittle one of my chest hairs from root-to-tip at about 3.0 centimeters from the point of holding. Also polished the aluminium pommel a bit on a felt wheel, recut the swedge with a small diamond file, and next step is to refine the swedge surfaces a bit more. .... the apex can now whittle one of my chest hairs from root-to-tip at about 3.0 centimeters from the point of holding. Honestly? How long do you wear it and where do you get it done? Good job on the Blade!